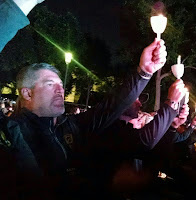 Director Hilkey at the 2016 candlelight vigil. In May we pause to remember, thank, and commemorate those noblest of public servants: the individuals who gave their lives while serving the public. In 1962, President Kennedy proclaimed May 15 as National Peace Officers Memorial Day and the calendar week in which May 15 falls as National Police Week. Established by a joint resolution of Congress in 1962, National Police Week pays special recognition to those law enforcement officers who have lost their lives in the line of duty for the safety and protection of others. CDPS Director Stan Hilkey and Deputy Director Bec Spiess will travel to Washington D.C. along with other representatives from CDPS to pay tribute to fallen officers at a candlelight vigil on May 13. Here in Colorado, the Colorado State Patrol and local law enforcement partners are hosting a series of events to honor the service and sacrifice of law enforcement officers. On April 21, law enforcement agencies from throughout Colorado gathered at the State Patrol Academy to dedicate the newly remodeled Colorado Law Enforcement Officers Memorial. The memorial was erected in 1979 as a tribute to Colorado's fallen peace officers. To enhance the experience for visitors to the memorial and better honor those memorialized at the site, donors funded improvements to the memorial that included landscaping, a garden with a running brook, pavers, a larger-than-life statue of a grieving officer, and a piece of the Twin Towers. On May 5, Colorado law enforcement agencies will memorialize the individuals who lost their lives in the line of duty over the past year. The event is at 10 a.m. at the Colorado Law Enforcement Officer Memorial at the State Patrol Academy, 15055 South Golden Road, Golden. Finally, on May 13, in conjunction with the national event, the State Patrol will host a candlelight vigil from 7-9 p.m. at the Law Enforcement Officer Memorial. Civilians are encouraged to wear the National Law Enforcement Memorial pins that CDPS distributed last year; if you joined CDPS within the past year or did not receive a pin last year, ask your Division's Executive Assistant for a pin (we have distributed pins to each Division). First responders and the public will gather at the Colorado Fallen Firefighters Memorial in Lakewood on Saturday, May 6, to remember the firefighters who gave their lives in service to the citizens of Colorado. Activities will include a fire apparatus parade beginning at 10:30 a.m. and ending at the memorial site on Allison Parkway. The memorial service will begin at 11a.m. at the Lakewood Cultural Center at 470 s. Allison Pkwy. For more information and to RSVP, please see the event invitation.